This weekend was that rare weekend when we had very little we needed to do. We listened to jazz in the sculpture garden. We ate ramen. We drank one too many vodka sodas and danced our faces off. We ate Italian and maybe drank too much wine. We went to the movies – I even got to pick, since it’s my birthday week . Crushed it. Sort of like this salad. And the Barden Bellas. Whisk together your marinade. Place chicken in large ziplock bag and pour the marinade over it; make sure the chicken really bathes it all in. Place in the fridge and let it rest for about 2-3 hours – any longer and the soy sauce will start to really toughen up the meat. Heat two large grill pans (jealous of those of you with REAL grills); coat with nonstick spray. Cook the chicken 3-4 minutes on each side over medium heat. 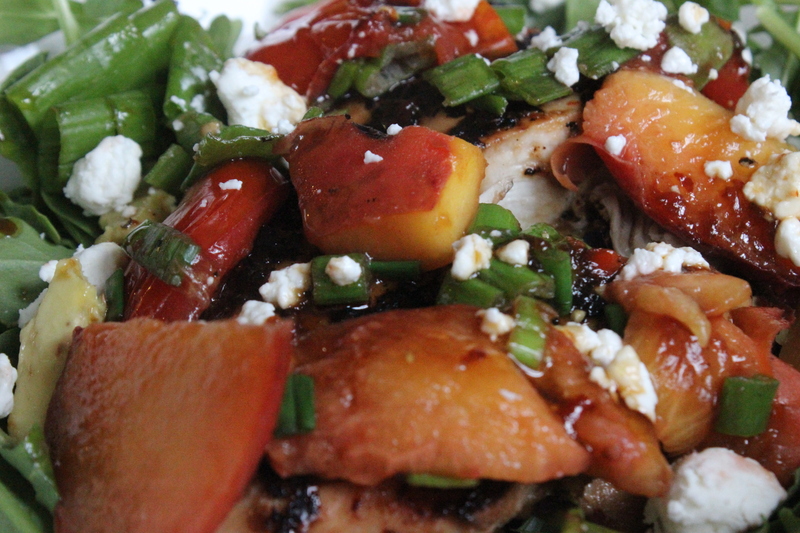 In a separate pan, toss together the peaches & tomatoes and grill those about 3-5 minutes total; add the green onions at the end, so they don’t overcook. 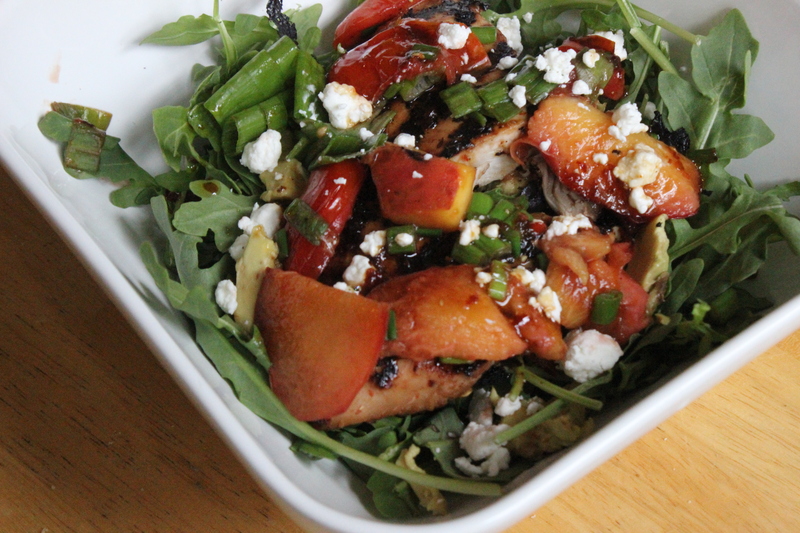 Add all salad ingredients together – arugula, avocado, chicken, & grilled fruit. Whisk together a little dressing using (most of) the same ingredients as the marinade and toss the whole salad with the goat cheese. There’s going to be a tussle tomorrow for who gets to bring the leftovers for lunch.